When my mouse skimmed across the page of the London Futurists meetup site a few days ago, it briefly triggered a pop-up display that caught my eye. The display summarised my own activities within London Futurists. “Been to 100 Meetups” was the phrase that made me pause. That’s a lot of organising, I thought. That figure of 100 doesn’t quite tell the full story. The events that I’ve organised under the London Futurists umbrella, roughly once or twice a month, are part of a longer series that go all the way back to the 15th of March 2008. In those days, I used the UK Humanity+ group in Facebook to publicise these events (along with some postings in blogs such as Extrobritannia). 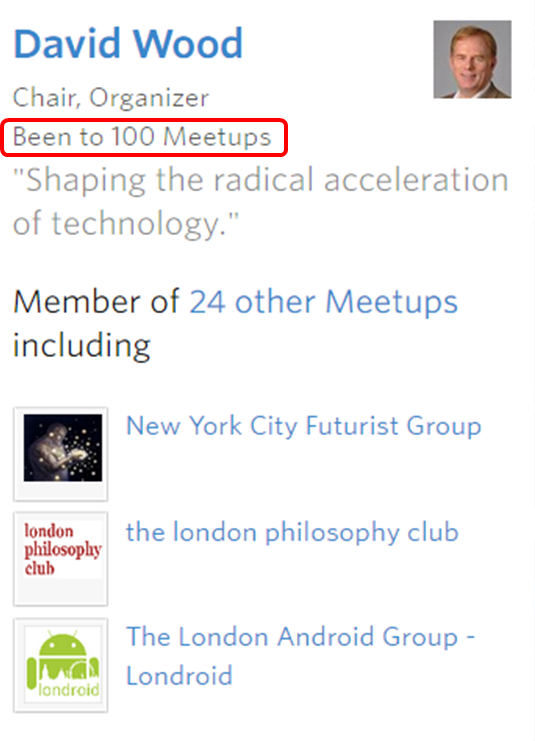 I discovered the marvels of Meetup in 2009, and adopted the name “London Futurists” from that time. 6 events already in 2015. More recently, we’ve videoed the events, and make the recordings available afterwards. Another important change over the years is that the set of regular and occasional attendees has grown into a fine, well-informed audience, who reliably ask speakers a probing and illuminating set of questions. If I think about the factors that make these meetups successful, the audience deserves significant credit. Wood’s contribution to the phenomenon of smart, connected mobile devices has earned him plenty of recognition… While others with a similar track record might consider their mid-50s to be the time to start growing wine or spending afternoons on the golf course, Wood thinks his “next 25 years will take that same vision and give it a twist. I now look more broadly at how technology can help all of us to become smarter and more mobile”. If you ask me today, is it possible to live to be 500? The answer is yes. According to political scientist and sociologist Roland Benedikter, research scholar at the University of California at Santa Barbara, “transhumanist” politics has momentous growth potential but with uncertain outcomes. The coming years will probably see a dialogue between humanism and transhumanism in — and about — most crucial fields of human endeavor, with strong political implications that will challenge, and could change the traditional concepts, identities and strategies of Left and Right. The launch of the Transhumanist Party in the UK. All being well, a video of that event will be posted online shortly afterwards, for those unable to attend in person. But for those who attend, there will be plenty of opportunity to contribute to the real-time discussion.